The point of etegami is that there are no mistakes. You don’t sketch our your images first on the paper — you draw your images and let whatever will be be. You don’t throw away “mistakes.” You send them, warts and all. But if you’re like me, you probably find sometimes you do a card that just isn’t what you envisioned. Or you find you accidentally made a huge mark outside the main image, in such a way that you can’t really hide it. Or you painted something that you just plain don’t like. The main thing I do is just cut up the pieces and leave them around till I feel inspired to use them. Here I’ll give a few examples in which I salvaged “mistakes” by creating collages with them. 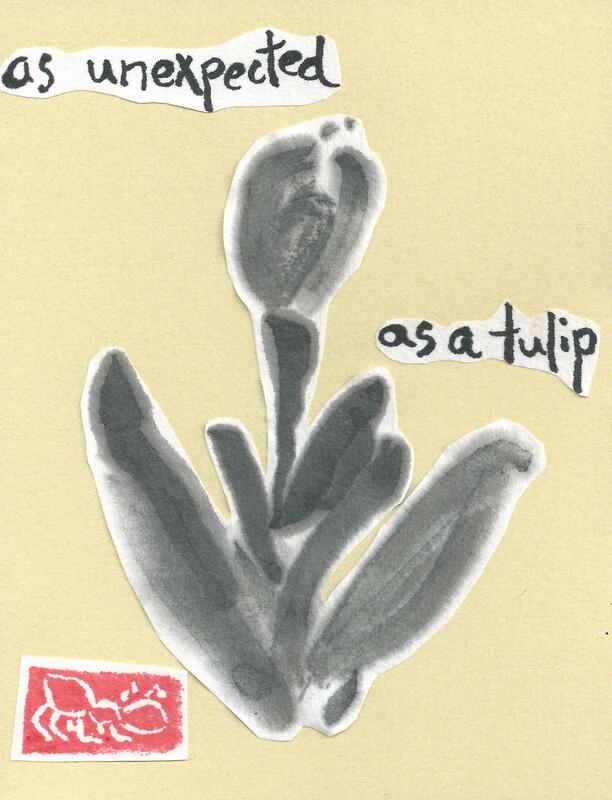 This first image, of a dogwood blossom, appeared on a card that just didn’t have a good “feel”. I had added some leaves, but they were awkward. I cut out the blossom and had it hanging around for a while. 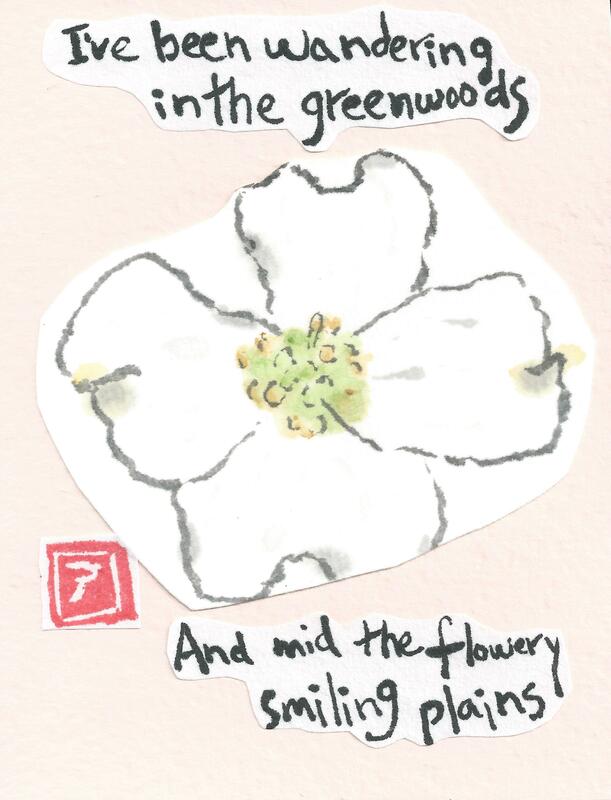 Now, mid-summer, long after all the dogwoods have lost their blossoms I found a nice quotation to use with the blossom — it’s a couple of lines from a hand-written poem by a 13-year-old Charlotte Bronte. 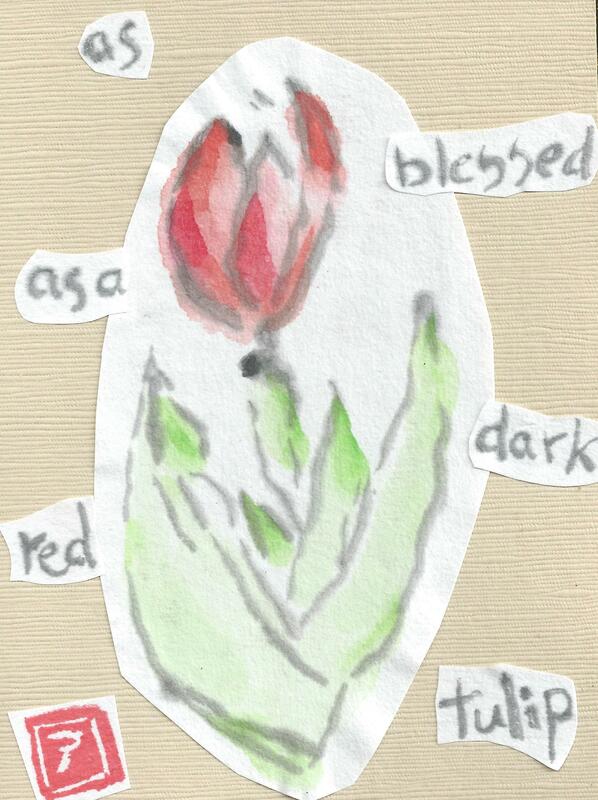 The next two examples are from some attempts to paint an abstract tulip. For the first one, I messed up the writing, so just cut out the flower to save for another time. The second one I did on hand-made paper I made at the Pyramid Atlantic Art Center last year. The paper isn’t very absorbent and when I wrote words on it, the sumi ink ran and got blotchy. 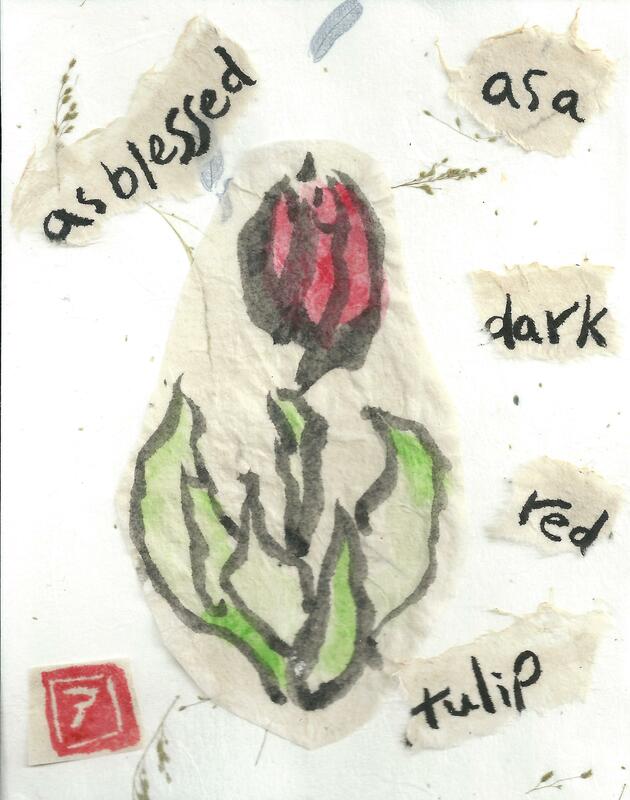 The words on them are a paraphrase from a poem by Alicia Ostriker — the full stanza that inspired my paraphrase is “To be blessed /said the dark red tulip /is to knock their eyes out / with the slug of lust /implied by /your up-ended skirt.” I like the sauciness of these lines, which match the sauciness of tulips — maybe someday I’ll use the full stanza in an etegami. Thanks! I have a few more odds and ends to try to work into cards. We’ll see what makes the “cut”!